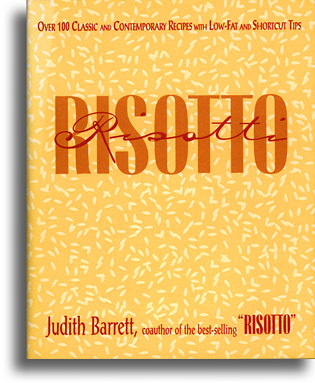 Years after coauthoring the widely praised and best-selling book RISOTTO, RISOTTO RISOTTI revisits Arborio rice with dozens of new recipes for preparing risotto in all its many manifestations. Risotto has gone from a barely known ethnic specialty to a popular, almost-mainstream food that can now be found in countless restaurants, Italian or not. There’s an easy to follow risotto reference guide that simply and directly explains what risotto is and moves on to its history, which varieties of rice are suitable for risotto (there’s now an American Arborio rice), essential equipment, and tips for serving risotto. Adding to the classic repertoire of traditional risotto recipes, you can make a meal as simple as Risotto with Pan-Roasted Eggplant and Mozzarella. Or if your taste runs to the luxurious, indulge in a classic turned very classy Saffron Risotto with Gold. Recipes for more adventurous cooks include preparations with ingredients from cuisines outside of Italy where rice is a staple such as Asia, the Middle East, and the Tropics. And relating to the way people really cook and eat, there are short-cut and low-fat techniques for risotto, too. Whether you’re a risotto convert or this is your first taste, RISOTTO RISOTTI will delight and satisfy rice lovers everywhere.